Over the past thirty years Elaine Sutcliffe has competed to International 2 star FEI Standard, attained Level 6 Dressage Riding and undertaken instruction by nationally recognised trainers. She has studied and trained in bitting theory and practice, has been awarded the preliminary certificate of Horsemanship by Kelly Marks and Monty Roberts and has accreditation in lorinery, body protector, air vest fitting and measurement. Elaines philosophy for her business is "Endorsing a holistic view of the horse, natural products and non-violent training." We ship at cost or offer free shipping on UK orders subject to order size. Within the UK we offer monitored delivery either by standard delivery or next day. For non UK orders please contact us in order that we may seek the best shipping cost for your purchase. You can purchase from us in confidence. We are members of the British Equestrian Trade Association (BETA), which promotes professional standards, ethical policies and quality safety standards. We accept payment by credit/debit card, PayPal, & personal cheque. Cool Short-Sleeved Shirt in Grey Check with double pleats across the back. Comes with logo'd detachable cream and matching colour collar stocks. 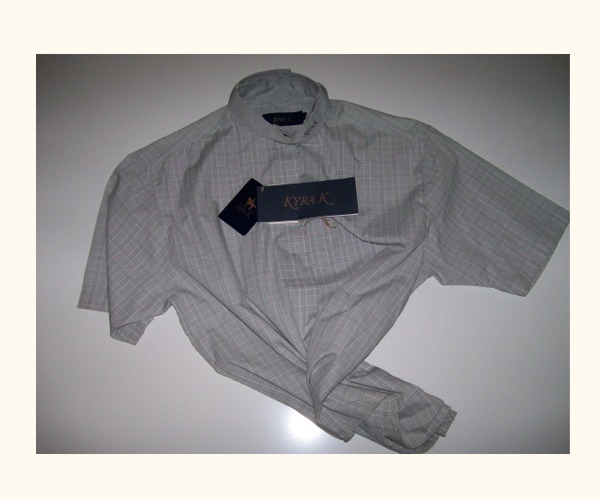 This product was added to our catalog on Monday 26 November, 2007. Copyright © 2019 WhiteRose Equestrian. Powered by Zen Cart. Responsive Zen cart templates by Picaflor Azul.